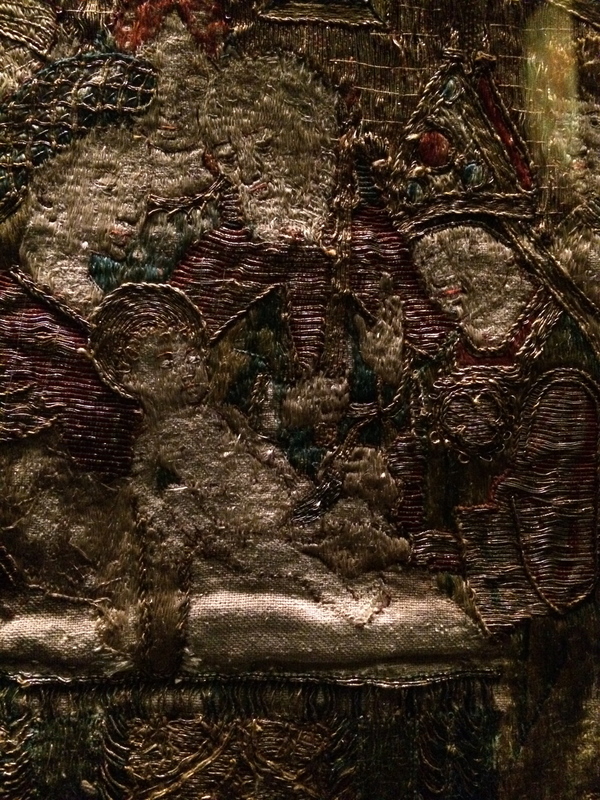 Heavens’ embroidered cloth: – Medieval buried Treasure. 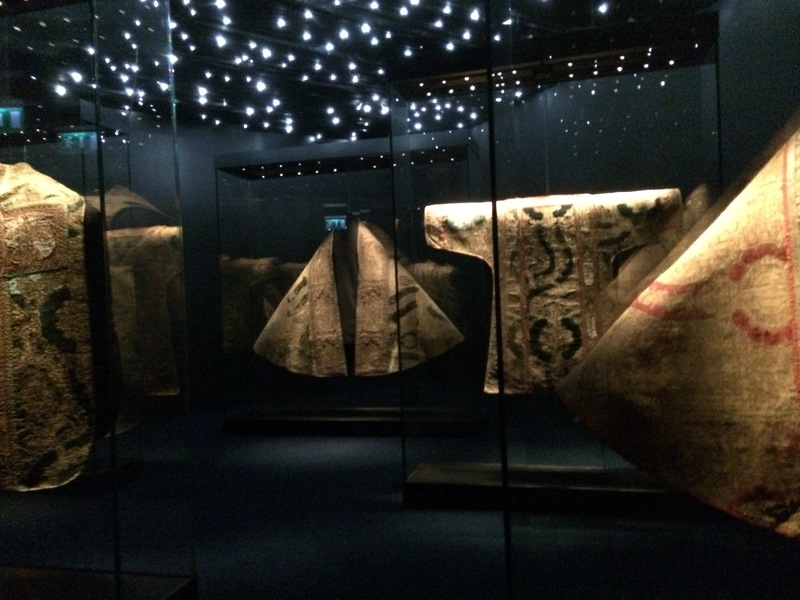 Look at these… They are the last complete set of mass vestments left intact in Northern Europe. And they are extraordinary in their history, their conception, and in quality. They sit now, in their light-controlled, temperature and humidity controlled, bullet-proof glass cases, in Waterford’s wonderful medieval museum. This is a purpose-built exhibition centre dedicated to the city’s wonderful history. It was opened only in May 2013. 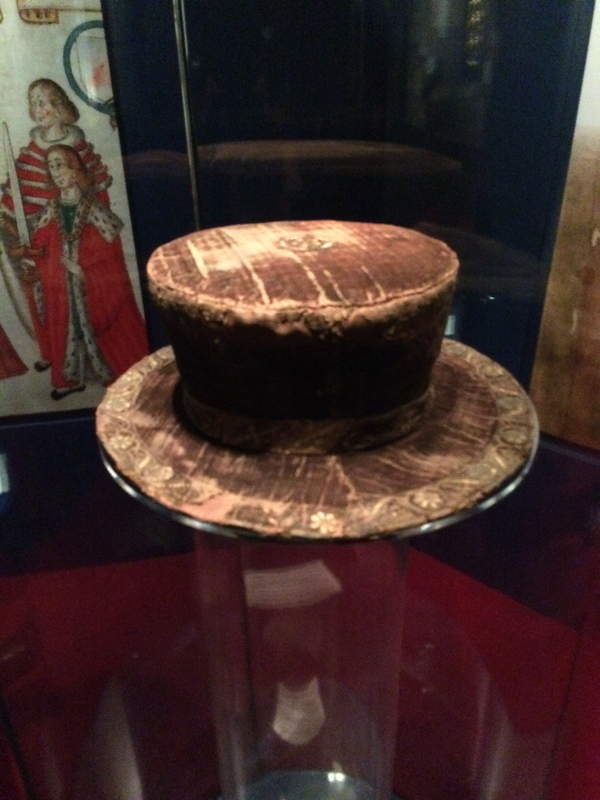 Or look at this hat for another example. It once belonged to Henry VIII. It was called his Cap of Maintenance. I can’t quite convey how remarkable these garments are. Not just aesthetically, obviously they are ethereally beautiful. But also for what they teach us, and for what they signify too, politically, religiously, and economically. When we modern-types think of the Medieval to Renaissance period at all, we think first and foremost of exquisite, beautiful paintings. But in one sense that’s ahistorical, since during that era embroidery and tapestries were more highly prized and in fact were vastly more expensive. Henry VIII’s court painter, the German master Hans Holbien was paid perhaps £50 per year for his position, plus what he made on private portrait commissions. 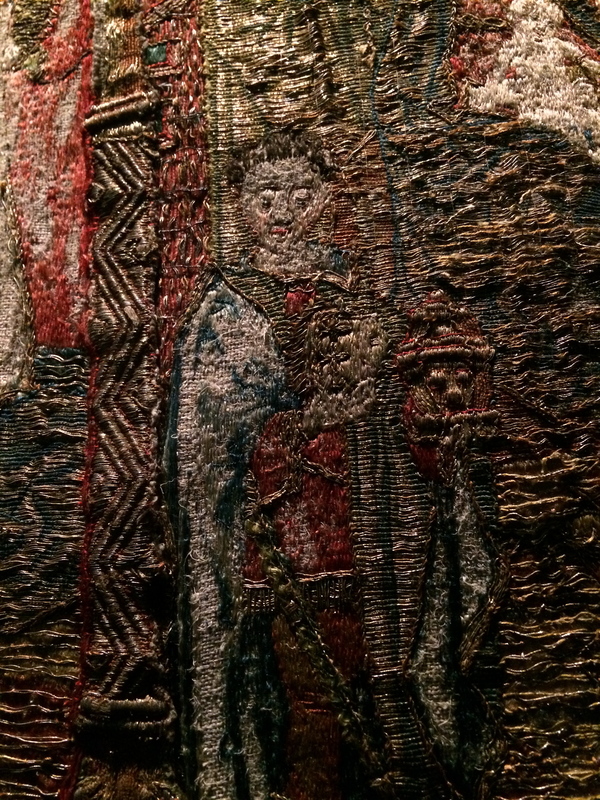 By contrast Henry paid around £1000 for each one of his best series of tapestries, displayed at Hampton Court. That figure in modern values: £1000 would have built Henry a state of the art battleship, with enough left over to fit it out with sails, rigging and cannons. In other words, no mere barons, nor even very wealthy merchants could not afford the best tapestry. It was the exclusive preserve of mighty magnates and rulers, of Dukes, powerful princes, of Popes and Kings. One final example: of the two best tapestries in Farmleigh House today (previously home to the Guinness family) one of the tapstries was formerly owned by the Duke of Parma; the other by the Queen of Spain. The reason for the enormous values placed on them was of course the sheer amount of labour needed. Entire teams of highly skilled workers were required. To this one must add the cost of very expensive materials and dyes used. The fantastic wealth of the city of Albi in Languedoc for example, was almost entirely founded on the wode trade, the primary blue dye of the era. 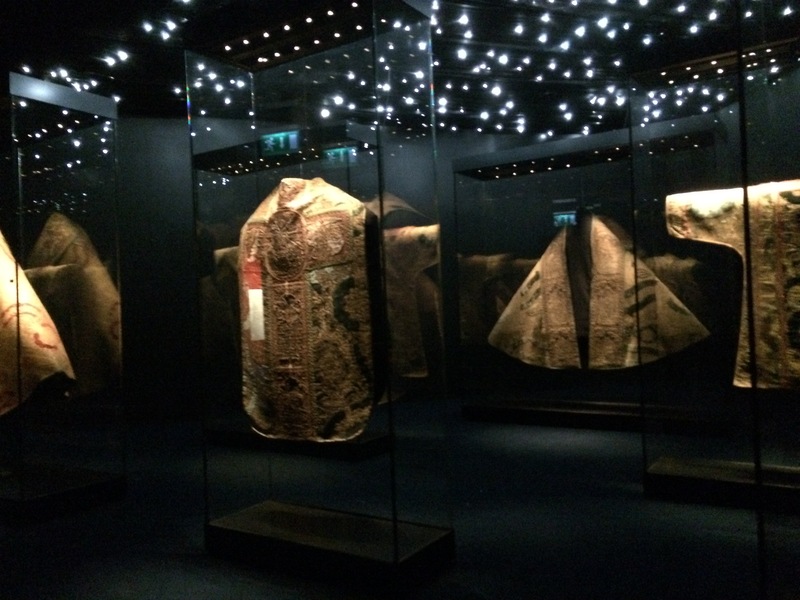 Let’s look at the materials in these vestments in the Waterford Medieval museum. The silk came from China originally. In ancient times it would have traveled across Asia and the Middle East on the Silk Road. Or later, after Marco Polo and the great Portuguese and Genoese explorers, sometimes shipped by merchant adventurers, across the Indian Ocean and around Africa. The silk was then spun, typically in Florence. Again, silk spinning was one of the main sources of that city’s extraordinary wealth. Like Albi and like Bruges (see below) the trade accounted for much of its great wealth, indeed as well as its preeminence in the late Medieval-early Renaissance period. Once spun, the silk then went from Florence to Bruges. This Flemish city was the centre of weaving in Europe, and where all the best work was done. This time-consuming practice was then carried out with great skill and experience, and, as you’ve already guessed, commensurately astronomical expense. These particular vestments in Waterford have something else, which would have pushed up the price even higher. They each contain a large amount of gold thread. Our guide told us he’d once had the opportunity to briefly wear one before it was encased in glass. He said the weight was such that he could barely stand. 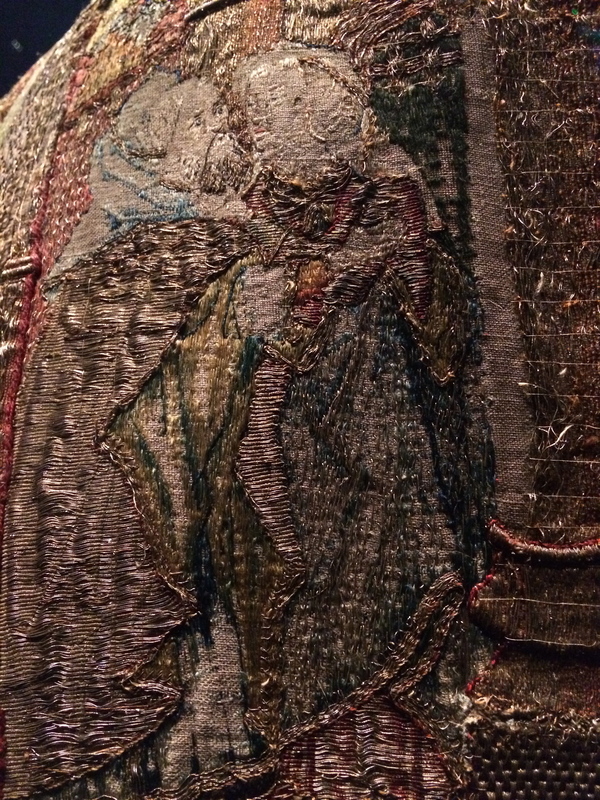 The set is comprised of three copes (large cloaks) two dalmatics (a T-shaped garment) and a chasuble, which is the full length, outermost gown, used for celebrating the Eucharist. 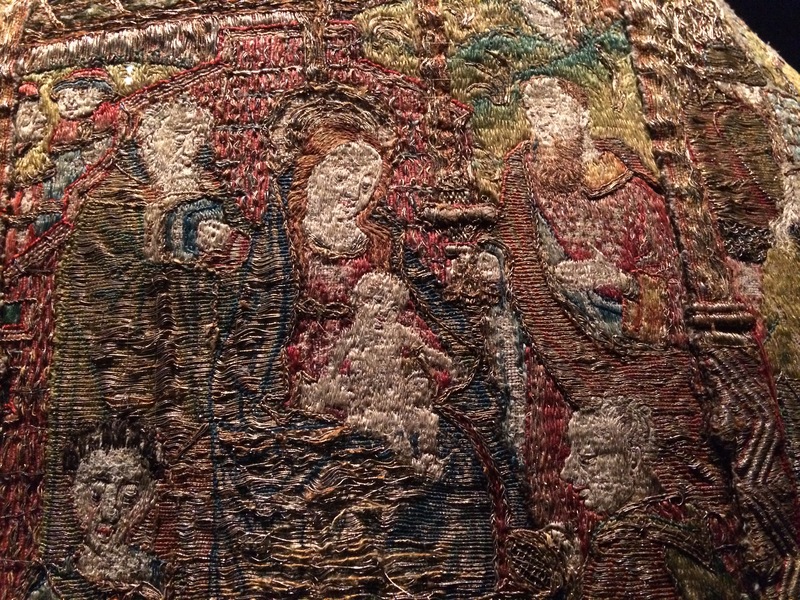 They are all embroidered with panels, depicting scenes from the Old or New Testament, depending on the individual cloak, or from the life of the Virgin Mary. This one below, as you see, depicts the Nativity. They were made in the 1400s, commissioned by the Dean of Waterford’s Cathedral for a special new chapel, commenced in 1468. It was a chantry chapel, in other words dedicated to masses and daily prayers for the dead. As the excellent museum website explains. “In Waterford in 1468, John Collyn, the Dean of Christ Church Cathedral decided to build a chantry chapel adjoining the cathedral and in this special place of worship Masses would be said for the souls of the dead. Those who supported the building of the chapel with gifts of money or property would have their names or the names of their loved ones included on the daily round of Masses celebrated by the chaplains of the chantry chapel. It seems certain the man who paid the lion’s share was a very rich merchant called James Rice. Rice may have been 11 times mayor of Waterford. 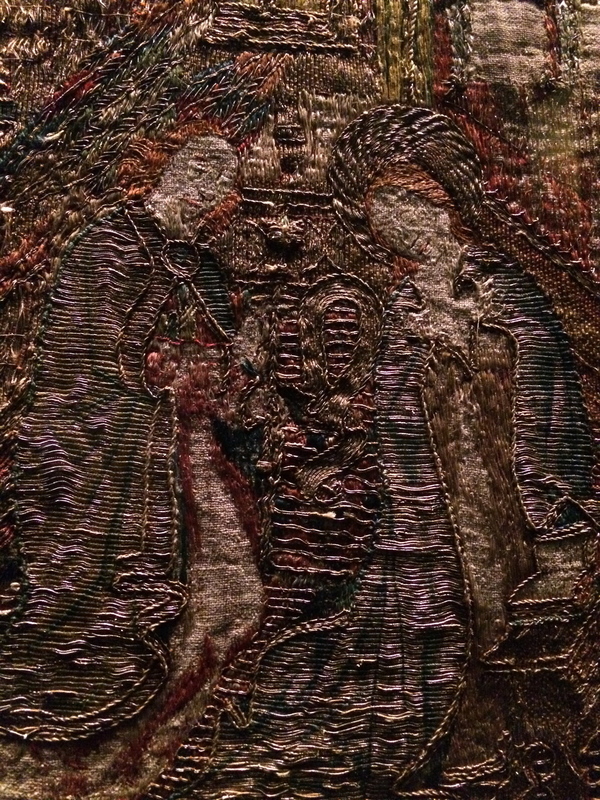 But the vestments are so fabulous in quality, so extraordinary; I was still scratching my head. I’ve rarely seen anything like them internationally, and never before in Ireland. True, there are superb vestments at the very old Diocese of Clonfert, traditionally associated with St Brendan. These are now in the small, excellent museum attached to the wonderful 19th century St Brendans’ Cathedral at Loughrea, the gift of the wonderful Edward Martyn. 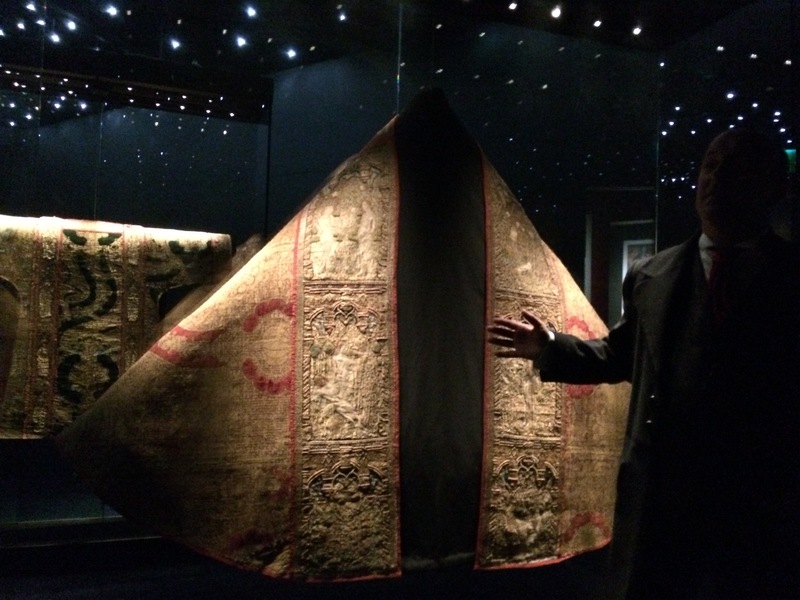 That eclectic collection of religious garments includes a mass vestment sent over by Napoleon III in memory of the Marquis de St Ruth, (a French field Marshall who perished at the Battle of Aughrim, 1691). That is also full of gold embroidery, knotted in the shape of bees (symbol of the Bonaparte family). But even that splendid item is much later, and not anything like these ones in Waterford. The quality of these puts me in mind of things one sees in the Vatican, or the Lady and the Unicorn tapestry cycle in the Museé d Moyen Age in Paris. They are extraordinary. Essentially, you may not see portable medieval items, of this quality, anywhere else in Ireland. You will have to go to Waterford. However successful Rice was, it didsn’t appear to make sense. I was still scratching my head. Until perhaps you realize that, for hundreds of years, Waterford had a Royal Charter, granting it a monopoly on the import and distribution of wine in Ireland. This provides some part of the answer. Our guide also refered to the widespread and very lucrative sale of indulgences by the local Cathedral. This of course was a rather dubious practice one that was rampant at this time across Europe, and of course one of the abuses that angered the catholic priest Martin Luther and helped trigger the Reformation. The vestments were worn for perhaps a hundred years, until the era of the Reformation taking hold in England. Now the threat of iconoclasm and their destruction became very genuine. They survived the initial incursions of Cranmer’s men, in 1500s Ireland. But a hundred years later, with the Catholic side loosing the Confederate Wars in Ireland and Oliver Cromwell about to take Waterford, the decision was made to hide them. They were hidden in lined boxes, in a specially-created cavity dug into the floor of the chapel, which was then covered over with flagstones. The caution turned out to be highly prescient. Their survival is something of a miracle. The Vatican, naturally, and some other major Catholic centres have equivalents. However no other full medieval set has survived in Northern Europe. They’ve all been destroyed, stolen, broken up, sold off and or have perished away. These are close to being unique North of the Alps. This Waterford set remained hidden, as war and rebellion and then more brutal wars bruised and battered Ireland though the 17th century. They were in fact forgotten, left in their hiding place, ultimately left there for over a hundred and twenty years. Until in 1773, the old cathedral, now an Anglican place of worship, was being demolished for the process of rebuilding. At that point they were finally rediscovered. The Anglican bishop to his credit did the right thing. He returned them to the Catholic diocese of Waterford. They are now on perpetual loan from the diocese to the city’s medieval museum. The choice of lines by the museum to title the exhibitions is perfect. You’ll recognise them. They come from one of the most famous poems by W.B. Yeats. I’ll leave you with that. Thank you for reading. The museums website is here. If anyone would like to learn more about the Anglo-Normans coming to Ireland, there’s a blow by blow, but hopefully readable account here. The Yeats quote is the perfect envoi to this piece, Arran; thanks for sharing this. Than ks so much. Delighted you enjoyed. Really nice to get your comment. A wonderful and informative article about a lesser known gem. The history of Waterford City itself is quite a rich tapestry. Incidentally the 11 times Mayor of the City was James Rice. Edmund Rice, another illustrious son of the City, founded the Christian Brothers and Rice Bridge in the City was named in his memory. Thank you very much. It got tweeted and reposted a few times, and so hundreds of people have read it the last 3 days. But few take a moment to comment. Very nice to get such positive feedback. Appreciate it. -Arran. 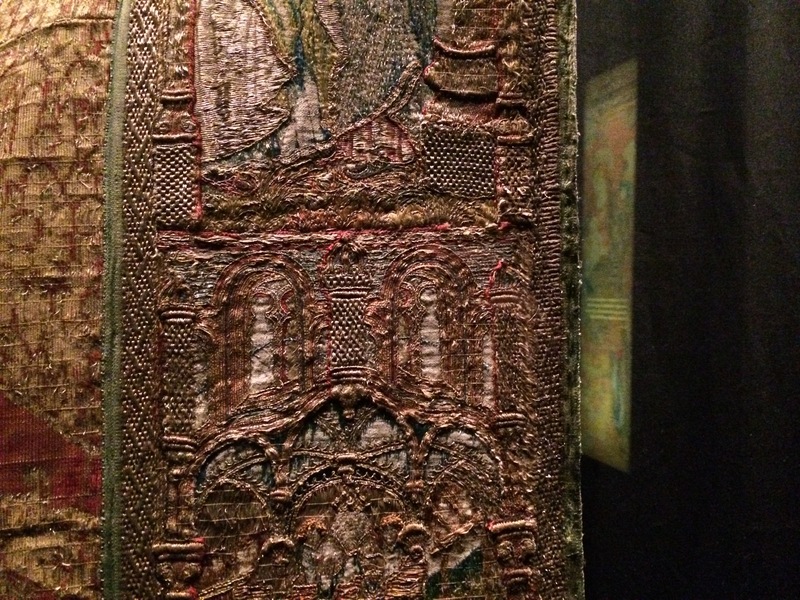 Very nice article.Visited the Museum today and was blown away by the beauty of the Vestments. A real treat! I totally agree with you, they are absolutely amazing. Something completely special, and entirely out of the ordinary, a real treat. My pleasure Helen, and thank you for taking the time to comment. I promise, you will love these vestments. Everyone is blown away by them. But particularly with your additional background knowledge, i suspect you will appreciate them even more than most. Next Post Italian Renassaince Art, a picture quiz.